It is hard to write a review for an event that I had on the calendar for more than 10 months. For 299 days, it was a big red circle on the calendar. And it did not disappoint. For us as a family, my crossing the finish line on the 2018 Mont Tremblant Ironman wasn’t just my success, but it was a success my whole family earned. My wife and children all made sacrifices so I could train and we could make this event our summer family vacation. Let’s be honest, I can’t think of a more expensive event. Registration, taxes, online registration fee, and yes, the photo package. And then the cost of the hotel and transportation… It is not cheap, but Mont Tremblant does it up right! We arrived on Friday, and checked into our hotel, which was right in the village, a 3-minute walk to the finish line. And it was worth every penny as the family could come and go as they wanted while I was on course. Athlete registration was on Friday, and had firm timeliness, but it was a pretty easy process. 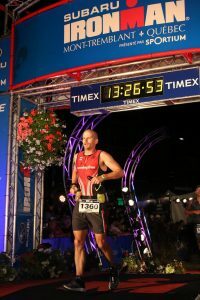 Show your ID, get weighed, sign your life away on waivers, get your bib, get two wrist bands (one, the official Ironman and one for telling everyone I was a rookie), get a can of Red Bull (Yuck. Who drinks that stuff anyways?!?) and you get a pretty decent gym bag. As it was still early afternoon, we wandered around Tremblant Village and the expo taking in the sights, sounds and stores. 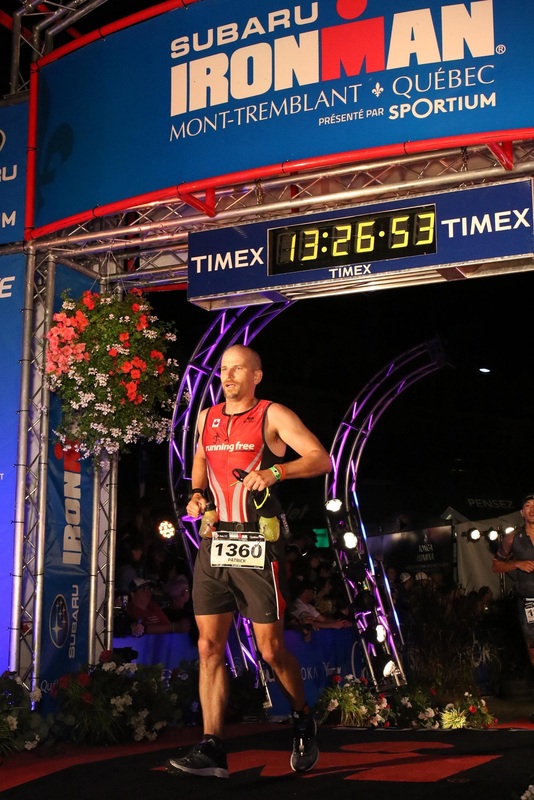 Yes, I picked up a few Ironman branded pieces of merchandise… And the merchandise was moving like hotcakes! Some stuff long sold out. Friday night was the Athlete Banquet, but we decided to eat in at the hotel instead of buying tickets for my wife and two children. But after the banquet was the Athlete Briefing which I wandered down and attended. The standard safety information and rules were presented, but the head referee also highlighted some dangerous areas, so it was beneficial to attend. Immediately after the briefing, a concert started in the Village by a pretty amazing group of singers and musicians. Dancing in the central court with my wife and kids was definetly a weekend highlight. And following the concert was a great fireworks display that lit up the sky. Like I said… Tremblant does it up! Saturday was bike and gear check-in. A bonus for me was that the organizers had people on hand in a particular area that rookies could go to and get information from or ask last minute questions. It was good to have my last lingering questions answered as it eased my mind that much more. After checking in the gear, the family went up the gondola to the top of the mountain and enjoyed the views. It really is a spectacular view. Seeing all the peaks of the surrounding mountain range. It was the first time any of them had ever been up to the peak of a mountain and Wow. It is beautiful. And does show you just how small we truly are in this massive world. After taking it all in that day, we cooked up my traditional pre-race pasta dinner. It was all about comfort and familiarity, then early to bed. And then came Sunday morning. It was a flurry of excitement. The alarm went off way too early for anything sane. But no one is doing anything sane on this day. |After a quick bite at the hotel’s continental breakfast, off to transition and it was buzzing. And the vibe never diminished. I wandered down to the bike racks and put the water bottles on the bike and checked the tire pressure. Then meandered over to the special needs bins and and dropped my bags in the appropriate bins. Lastly, over to the change tent to add my running bottles to my belt. It really is a lot to take in. But planning and having everything laid out, well in advance made it smooth. After that, it was a short wander down to the lake. Being outside before the break of dawn was something different too. Walking past a break in the trees, I noticed the lake, sorta… What I really saw was a lot of fog, but never thought much of it. The fog ended up being a problem. The race start had to be delayed by a full hour because you couldn’t see the next buoy in the lake. From a lifeguarding perspective, it was pretty dangerous conditions to oversee. One of the highlights of the pre-race was a fighter jet fly-by! How awesome!! Not just one flyby, but it went screaming by twice! As the race was being delayed, I opted to stay up by the road and hang out with my wife and kids. They kept my mind distracted and I enjoyed the extra cuddles. As the announcers stated that time to start was closing in, I headed down to the beach to take in the starting area. 2500 athletes, standing around, looking like anxious sleek seals. What a beautiful sight! The pros went off… Then the faster swimmers… Then, as we all had to be in the water by 8am, they simply said everyone keep moving ahead. Like a herd of cattle being ushered down a lane way to the pasture, away we all went into the water. The swim was pretty straight-forward, mostly good people checking on each other when they happened to lift their heads at the same time, pointing out the next buoy if the other person seemed confused. But there was the one exception… One person grabbed my ankle… I didn’t like that much. I generally swim and pull with just my arms, dangling my legs behind. So I decided to start using my legs and flutter kicked for a few moments. I didn’t get grabbed again. Out of the water and trotting along the beautifully carpeted path was pretty great. I wasn’t racing. Let’s be honest, first time around, it was all about finishing. Slow transition, making sure I got everything on or in the right pocket… And out to the bikes. Grab the bike, trot to the mount line and down the road I go. It is two loops of a 90km circuit. From transition, out to the Highway had a few respectable climbs, then along the highway had a few looooong grinders to the turn around at the 35km point. Yup, more grinders on the way back. But as luck would have it, I happened to stop at an aid stations, and found a table to refill my drink mix on… And there was a lady standing there asking what kind of sunscreen I wanted, spray or cream! Bonus! Saved from a complete sunburn! Then back onto the roads and we continue past transition. Up to this point, there were some hills… But this is where the steep hills get introduced and a few ugly climbs. This is a 10k out and back stretch that really tests your legs! So be aware. And then yipee! You get to do it again! It is rather cruel that at the end of each cycle loop there is 20km of hills… But it is what it is. I always keep one thing in mind… Steep climbs on the way out mean fast descents on the way back. So tuck in tight, and pray for a straight line! After the two loops and hopping off the bike it was kinda odd to just give my treasured bike to some random stranger and assume they were going to put it on the rack. But the volunteers were amazing along the entire course!! I had to kick my cycling shoes off cause they were killing me, so I went from the dismount area to the transition tent in my socks. What a sense of freedom! And to note, it was the first time I cycled an Imperial Century!! 100 miles! (160km!) Wohoo! Into transition for a casual change, and listening to the older gentlemen around me saying “We are just going to go easy, probably a 4:30 marathon”. Wow! Good for them! Hmm… And here I am just planning on finishing. Out the other side of the tent, I see the family waiting and cheering. Talk about a great way to launch the last leg. I stop and give hugs and high-fives and then blurt out: “Just a marathon to go!” The people on the other side started laughing. I guess it was a rather nonsensical thing to say. But hey… That was my mindset at that moment. Well, after getting on my way it starts with hills. (Go figure). Getting out of the Village was hills, but then it hits a pretty sweet, paved and flat converted train trail. This was a nice relief. Again, the volunteers at the aid stations were outstanding! Out to the turnaround and back along the train path heading back into the village… and hills. The village was exciting as you are coming down the middle of the village with families and friends cheering. But then arrives the split. Less than 100m from the finish line, the path splits. 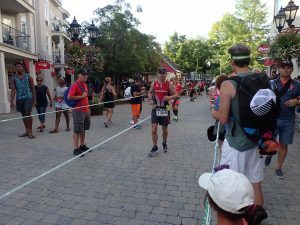 Soooo close to the finish line you can smell it, taste it, feel it… And you have to veer right, away from it all and head out to do another half marathon, starting and ending with hills. But after the second loop of torture… After accepting the fact that your gut doesn’t want anymore Gu or food or anything… After your legs have decided to go on strike when any hill comes into sight and you accept that walking up hills and trotting/trudging the flats is completely acceptable… After this second time around, the chute is even more spectator filled, cheering and waving and celebrating. After all the pain and discomfort, this chute is glorious. And to add to the glory, there they were. Just before the finish line, I spot the family. And it was the best hug and cuddle session yet! The finish was as spectacular as imagined. Lights, camera, cheering. What really made this event the success it was, in my opinion, was the cooperative, supportive community of athletes. Everyone wanted to see each other succeed. 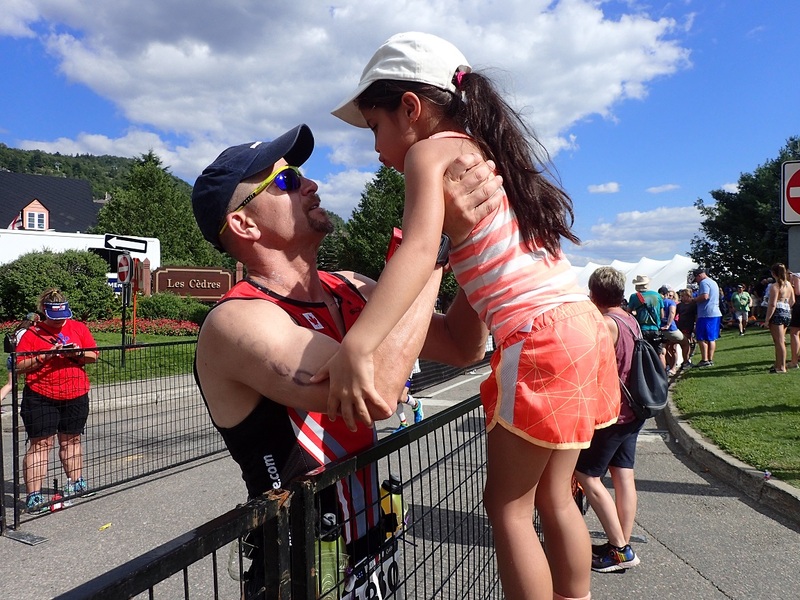 Any questions asked to another athlete were answered in a supportive manner. When someone was stopped along the way, others called out to see if they were OK. Even on the FB group, the athletes were supportive before and after, even asking about competitors they saw injured on the course, finding out if they were ok.
By no means is this an easy course. By no means am I fast. But I am a finisher. But I really have to make a huge admission. I didn’t do this alone. I have an amazing wife and kids who supported this endeavor. 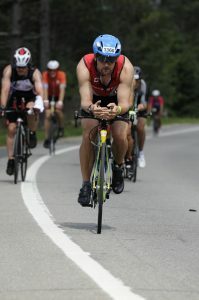 I had great winter cycling coaches who were Ironman, that I tapped into for tips. I had a great group of runners that got me tuned up for spring marathons and races. I had a great cycling partner who kept me on schedule, building up distance throughout the spring and summer. And I had some great motivators. I didn’t do this alone. We all did it together. We got me there. So anyone who ran with me, cycled with me, paddled beside me, offered a word of encouragement, asked how my training was coming along, did anything to help me along: THANK YOU SO MUCH. I am lucky that I have a strong body that can endure 13 hours of endurance. But I am also lucky that I work somewhere where I see individuals of all abilities. I get to watch them working to improve themselves, no matter how injured or challenged they may be. I was watching a particular member named Steve perform some exercise to help regain his strength and balance. A year or two ago, he had an aneurysm, which led to a stroke. He was working out to increase his ability to walk. His goal is to walk. To walk. It takes him 60 minutes to walk around the 200m track. 60 minutes. 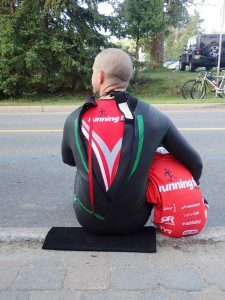 So who am I; A fit individual with complete use of my limbs, able to swim, cycle and run. Between knowing my wife and kids were on the course waiting for me and constantly repeating those words, that is what carried me through. 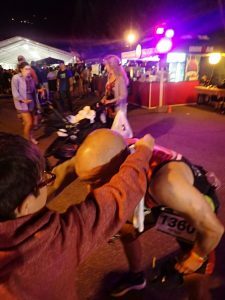 Even when my gut was in pain, my legs telling me there wasn’t much let in the tank… “Stopping is not an option.” I had to walk, but I was not stopping. And that is what this whole event was to me. Setting the goal. Moving forward. And achieving it. After crossing the finish line I couldn’t let a stranger put the medal around my neck. There were three special people waiting for me to come out, and they deserved to put the medal around my neck. If you get the chance, this will be the event that you remember. Cheers and see you out and about. The bottom line: You CAN BE an IRONMAN.